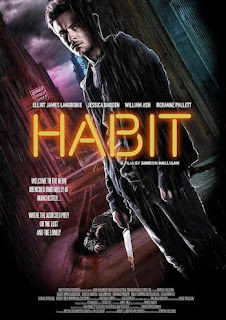 From director Simeon Halligan (White Settlers, Splintered) and based on the cult novel by Stephen McGeagh, HABIT is a blood-drenched and intense claustrophobic film set in the underbelly of Manchester starring Jessica Barden from the hit Netflix show The End of the F***ing World and Showtime’s horror drama series Penny Dreadful. This shocking, visceral and, very often, twisted tale also stars Elliot James Langridge (Northern Soul), William Ash (The Tunnel), Sally Carman (Shameless), Joanne Mitchell (Attack of the Adult Babies) and Roxanne Pallett (Wrong Turn 6). HABIT centres around Michael (Langridge) who as a young boy, along with his sister, witnesses the suicide of his mother. Now an adult and trying to find his place in the world, Michael divides his time between the job centre and the pub. A chance meeting with Lee (Barden), an introduction to her Uncle Ian (Ash) and a heavy night on the streets of Manchester, lead to a job working the door at Cloud 9, a seedy massage parlour. After witnessing the violent death of one of the punters, Michael starts having increasingly blood soaked nightmares. Are they flashbacks or fantasies? Little by little, he finds himself being sucked into a dangerous twilight world that he doesn’t understand – but which he finds irresistibly attractive. Addictive even. Tantalising, gripping, dark and audacious, HABIT comes to UK cinemas 1 July 2018 on a wave of anticipation after its World Premiere at GRIMMFEST 2017 and Best Feature and Best Screenplay awards at the New York City Horror Film Festival the same year. Trailer for the new HALLOWEEN film released.